The pilgrimage is over, and we’re back in New York just in time to see the last of the falling leaves. But re-entry has been hard for The Boy, and me too, for that matter. 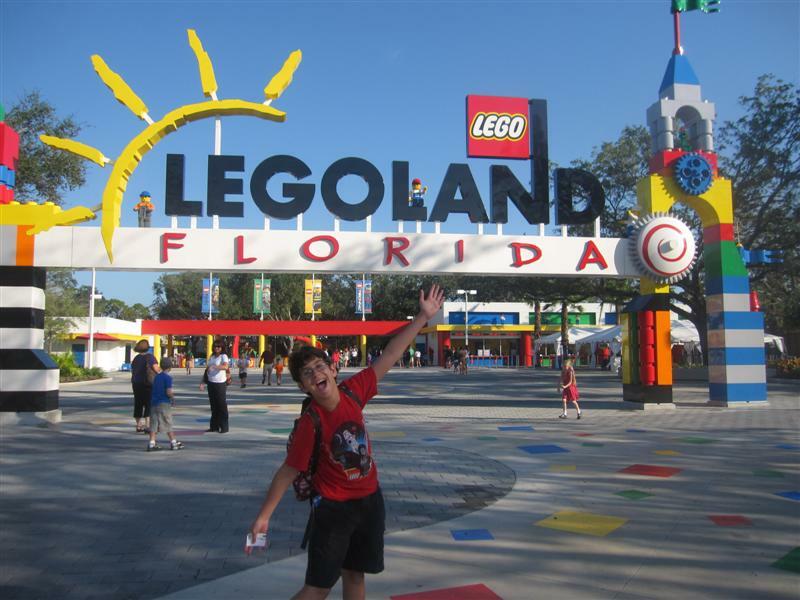 We were invited to visit central Florida for the grand opening of LEGOLAND Florida, the world’s largest LEGOLAND theme park. The Boy has fervently played with these colorful plastic bricks since he started walking. I’m not alone in believing that LEGO is a wonderfully engaging and educational plaything. 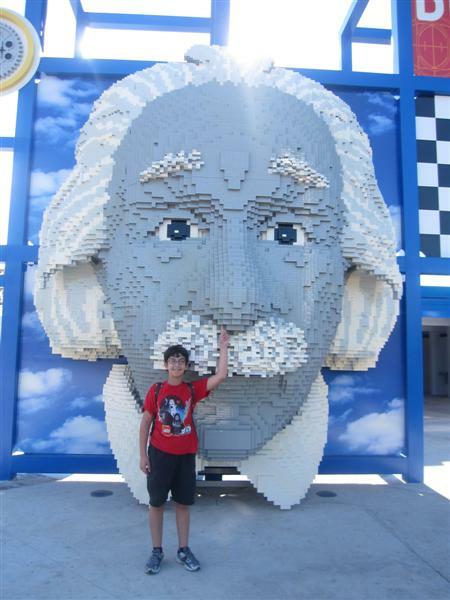 I believe that LEGO has encouraged his imagination, developed his analytical skills, and provided hands-on lessons in physics, engineering, and architecture. But in his eyes, LEGO is just his favorite hobby. I wanted this trip for him. Three years ago, we went to the only other LEGOLAND park in the U.S., and trekked cross-country to Carlsbad, CA. We’ve been looking forward to the opportunity to compare the parks. Remembering how much fun we had there made the anticipation almost unbearable! Who do you love more, me or Dad? I’m glad we had two full days to explore the park, because at 150 acres, LEGOLAND offers too much to do and see in just one day. Depending on the time of year, the hours of operation here may limit you to just seven hours in which to cover ten distinct sections. MY favorite part of the park was Miniland. I loved it so much that I’ll be dedicating a separate post to it in a week or so! Beginning at the main entrance and throughout the park, there are several hands-on areas where LEGO pieces are out and available for recharging moments of creative play. The best of these is the indoor Racers Build and Test area, where kids build vehicles of their own design, then run them down a variety of ramps to test their fortitude and speed. We found several rides and attractions unique to LEGOLAND, and to this park in particular. I enjoyed the 360° view when we ascended 150 feet in the air on the Island in the Sky. (The Boy… not so much.) 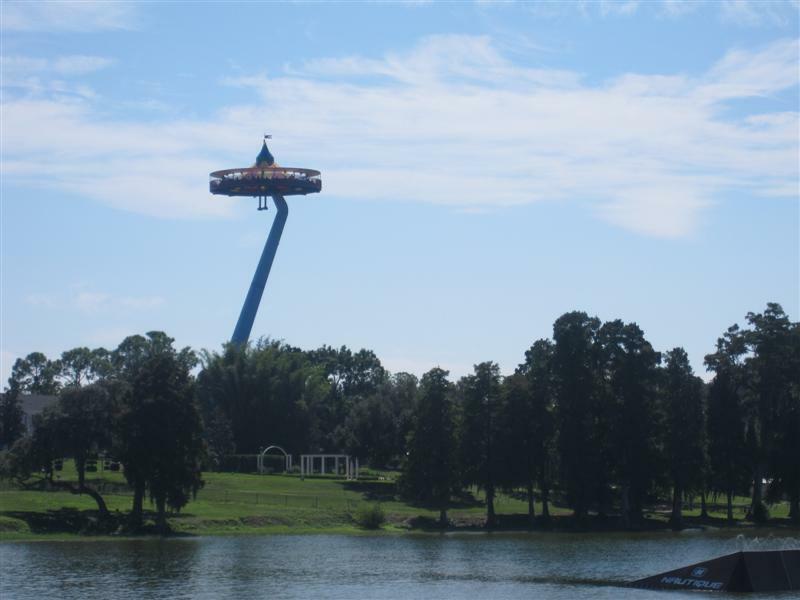 It’s the perfect vantage point to take in the entire park, as well as Lake Eloise and the green citrus orchards beyond. The Boy’s favorite was the Aqua Zone Wave Racers, which he remembered fondly from CA. We stood in yellow jet skis and raced around a circular central dock, while steering to avoid (or in his case, hit head on), fountains shooting water 15 feet into the air. I got soaked on this one. Considering the heat, that was a good thing. Since he’s now a “tween,” The Boy isn’t free-flowing with praise and enthusiasm. 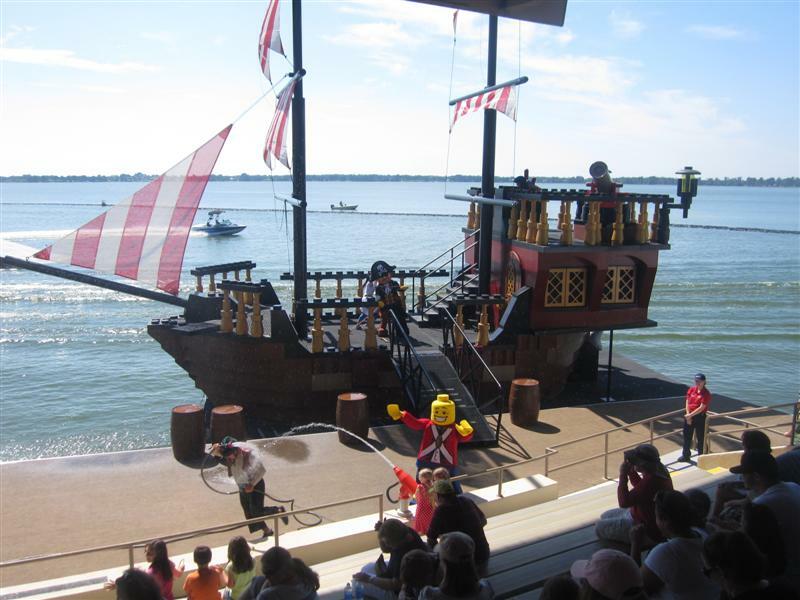 So it took me by surprise when I heard him exclaim “Awesome!” during the water ski show in Pirate’s Cove. During “The Battle for Brickbeard’s Bounty,” the brave Imperial Soldiers fight Brickbeard the Pirate, who has captured Miranda Valentina. I can’t wait to bring my niece and nephew here. LEGOLAND excels in catering to the pre-school set, more so than any other theme park we have visited. DUPLO Village is an entire section dedicated to children five and under, with indoor and outdoor play spaces. There are also multi-level playgrounds and play spaces in the Land of Adventure and LEGO Kingdom sections for them to burn off energy. This park is not just about riding rides and watching shows. ▪ Finding LEGO sculpture in the least expected places, like the sailors caught in nets hanging from the rafters on the Boating School dock. Discovering them was like finding “hidden Mickeys” at Disney World. 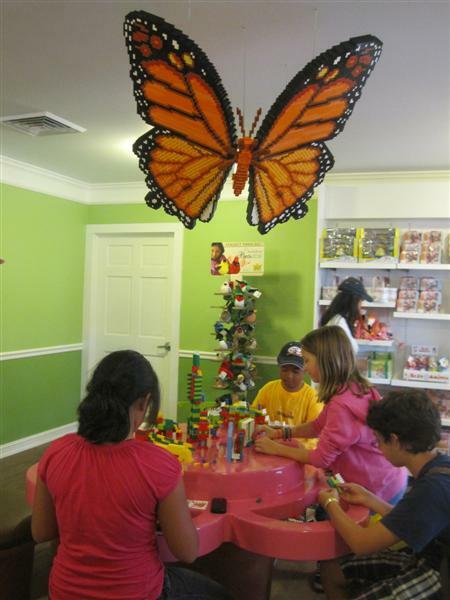 Loved finding LEGO creations in unexpected places, like this butterfly hanging in the Garden Shop! ▪ The Minifigure Market, a gift shop solely dedicated to the tiny LEGO figurines which have become affordable collectibles. The Boy was fixated on finding a boxer, and eventually got one. Park employees, or “Model Citizens,” attach them to their name badges and will trade with you. ▪ The cool comfort of the Fun Town Theater, which shows three different 4-D movies, complete with water, snow, and wind effects. ▪ The food options throughout the park are affordable (as theme parks go) and generally healthy (e.g. trans-fat free). You can easily find fruit cups, yogurt, and other kid-friendly options. 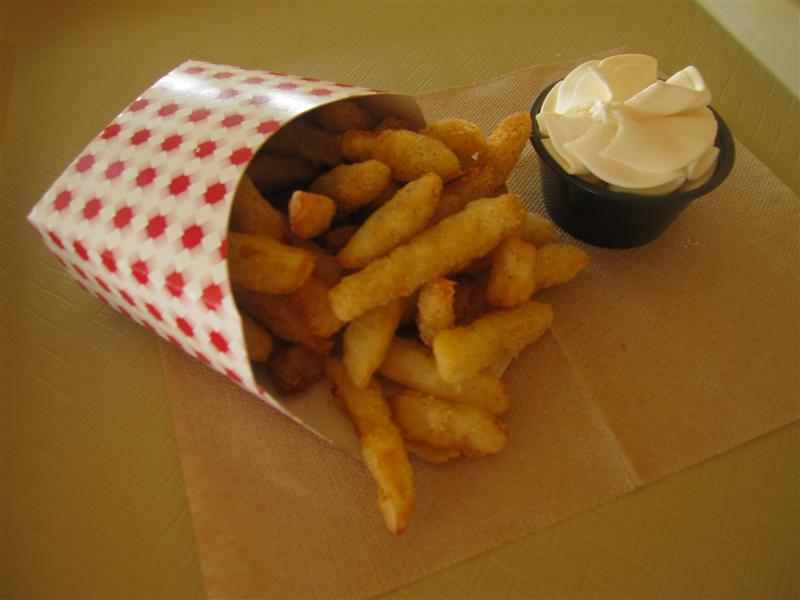 But I also must give a well-deserved “shout out” for Granny’s Apple Fries, a LEGOLAND specialty. If you (it’s okay to be a grown-up brickhead) or your kids love LEGO, then this park is an absolute 10. If you’ve never seen a LEGO before in your life, some of the thrilling bits will be lost on you. But you’ll still love it! Skip it if your kids are in their teens, because there’s not enough for them to merit the relatively hefty price of admission. Picking Einstein's nose. Such a classy kid. Disclaimer: Our visit was sponsored by LEGOLAND. Sounds like a really amazing place! Here’s hoping my 4 year old will develop an obsession with Legos so we can visit! Another fabulous, informative blog Traci! I’m impressed that the boy willingly admitted that the water ski show was, “awesome!” That is quite the recommendation from a tween! I absolutely cannot wait to go with the kids, and now that I have it in writing from you that: “I can’t wait to BRING my niece and nephew here”, I will let them know that cost is no object (Emphasis added, for, well…..emphasis). We did, and I really enjoyed the one-on-one time with my son. You know how special that kind of trip can be! None of my kids had much of an interest in LEGO, so I was surprised at how much they enjoyed the California Legoland. This new Florida version looks even bigger and better! Nice report and great pictures! 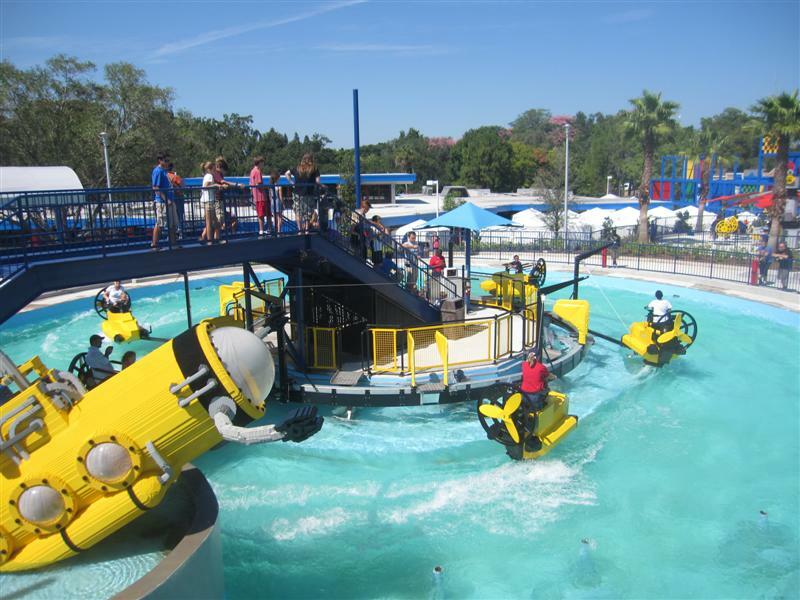 Do you know if Legoland Florida is available with any of the city multi-park passes? Thanks, Steve! I think just about anyone could find something to love at LEGOLAND, particularly Miniland. I don’t know if the park is part of any city pass program yet, but I would guess that it would eventually. Because it’s located half-way between Orlando and Tampa, it could work as as day trip from either city. 150 ACRES???? And filled with those tiny little bricks? It boggles the mind (and this from someone who visited the LEGOLAND in CA and thought it was huge!) Glad to see your son still enjoys those pesky little-hiding underfoot-always getting sucked up in the vacuum cleaner blocks! 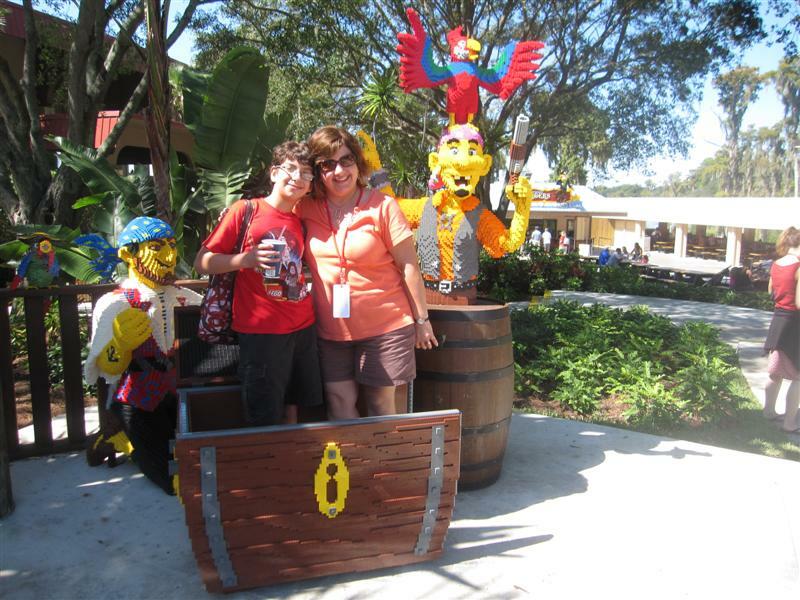 We couldn’t resist a visit to LEGOLAND when we were in Florida in December. My boys’ had wanted to visit in California for years. Miniland was a highlight on our trip. The new Star Wars Miniland was there too with a huge Darth Vadar that they just couldn’t get over. Sadly, they didn’t enjoy the rest of the park as much as Miniland. We did agree that we’ll return when they have children though. Thanks for linking up with the Best of the USA Blog Hop!